The LPS1-2T is a very compact microprocessor-controlled laser diode driver with dual temperature controller. It offers many advanced and unique features at a very competitive price. The device can drive up to three infrared laser diodes in series or one blue laser diode. 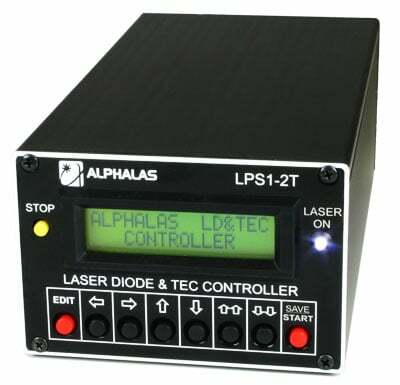 Different models of the LPS1-2T are available, depending on the maximum laser diode current. All devices feature constant current as well as constant power modes. Current limits, voltage limits and a soft-start delay can be set. A safety interlock is also implemented. The LPS1-2T is very easy to use. All parameters can be programmed through the symbolic self-explanatory controls. The two-line matrix display shows set values and actual values at the same time. ALPHALAS has implemented a novel switch-mode topology to achieve high efficiency, low thermal dissipation and a very compact design. A unique combination of analog and digital control guarantees very low current noise and high reliability.